Calling a special election for a bond renewal. 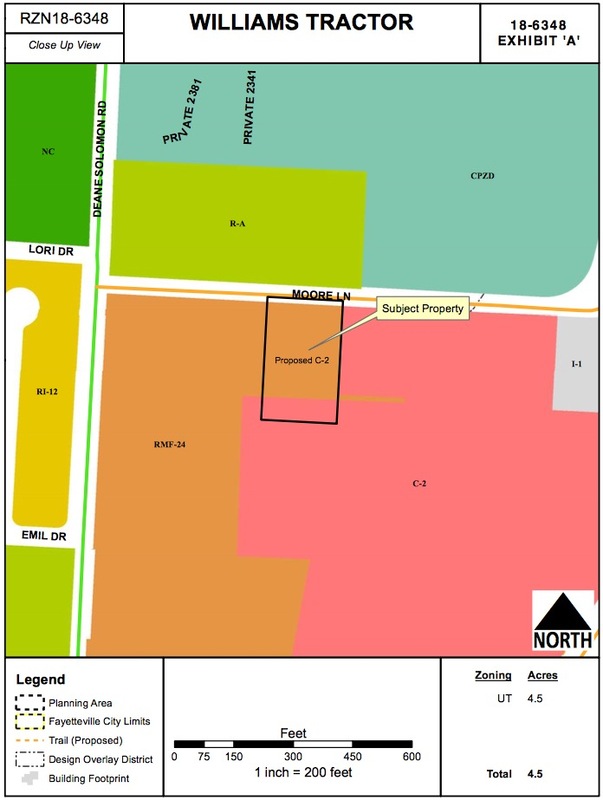 Rezoning 1.4 acres north of Deane Solomon Road. 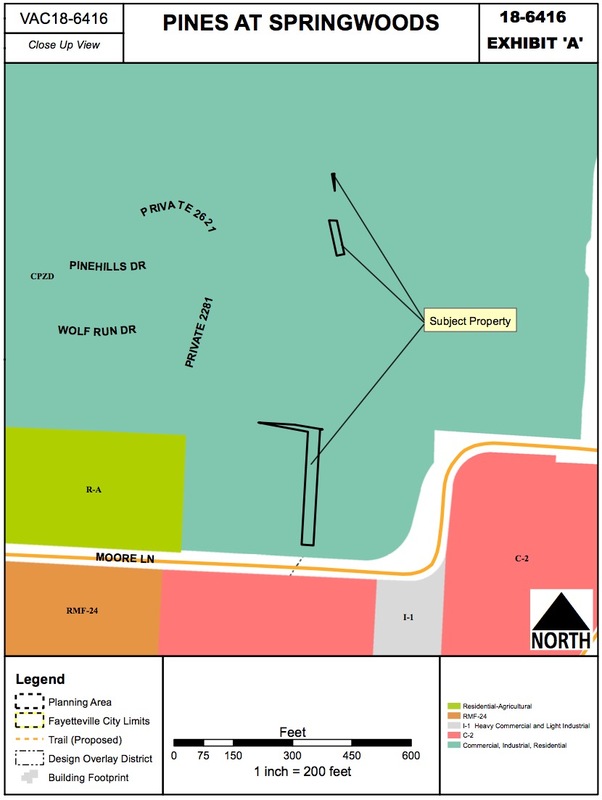 Rezoning 19.2 acres northwest of Rupple Road. Two cost share agreements for water and sewer mains. Renewing annual agreements for citizen recreation services. 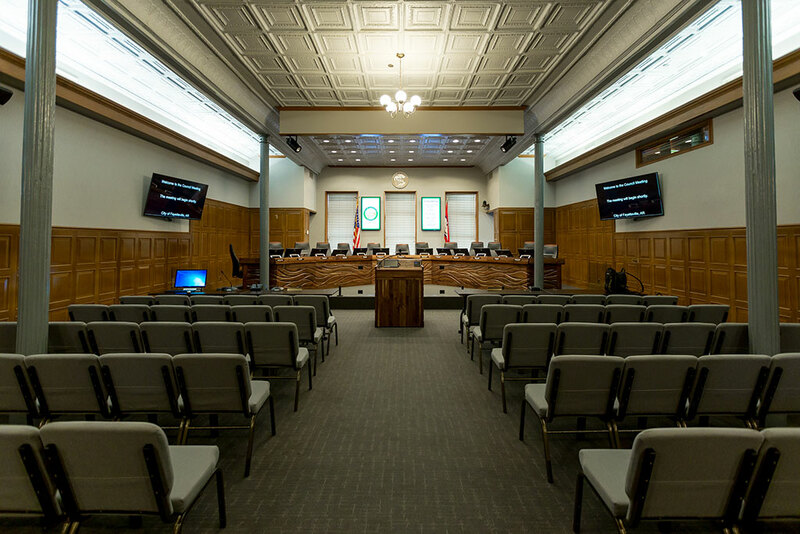 A meeting of the Fayetteville City Council begins at 5:30 p.m. Tuesday, Dec. 4, 2018 inside room 219 of City Hall, located at 113 W. Mountain St. in Fayetteville. A resolution to authorize Mayor Jordan to sign and assignment of and assumption of lease of Meadow Street Parking Deck levels 1 and 3, parking estoppel, and declaration estoppel in connection with the sale of the Chancellor Hotel. Notes: The Chancellor Hotel, which is owned by Southwind Hospitality Holdings, LLC, is being sold to GFAR Owner LLC. City Attorney Kit Williams said the purchase is expected to close on Dec. 14. The hotel leases space on levels 1 and 3 of the Meadow Street Parking Deck. This resolution essentially transfers that agreement to the new owners. 1. Selective Traffic Enforcement Program Grant (Details): A resolution to authorize a change order to the 2018-2019 Selective Traffic Enforcement Program grant in the amount of $6,600.00, and to approve a budget adjustment. 2. 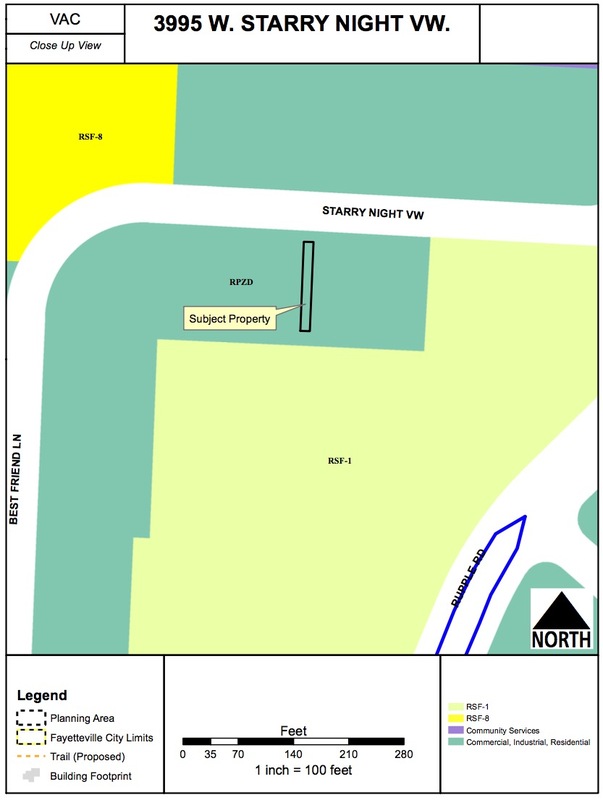 SurfCo Restoration & Construction, LLC (Details): A resolution to approve a change order to the contract with SurfCo Restoration & Construction, LLC in the amount of $8,550.10 for additional mold remediation at 2190 South Razorback Road. 3. Bid #18-48 Hutchens Construction Co. (Details): A resolution to award Bid #18-48 and authorize a contract with Hutchens Construction Co. in the amount of $54,411.50 for the milling, resurfacing and restriping of Parking Lot 55, and to approve a project contingency in the amount of $10,882.30. 4. University of Arkansas Lease Agreement Renewal (Details): A resolution approving a lease agreement renewal with the University of Arkansas for city operation of the university’s west annex parking lot as a revenue-producing off-street parking lot within the Dickson Street Entertainment District. 5. Shaw Sports Turf (Details): A resolution to approve the purchase and installation of synthetic turf at the Gary Hampton Softball Complex by Shaw Sports Turf pursuant to a Sourcewell Cooperative Purchasing Agreement in the amount of $531,752.00, to approve a project contingency in the amount of $79,763.00, and to approve a budget adjustment recognizing Parkland Dedication Fees from the northwest quadrant in the amount of $548,158.00 for the project. 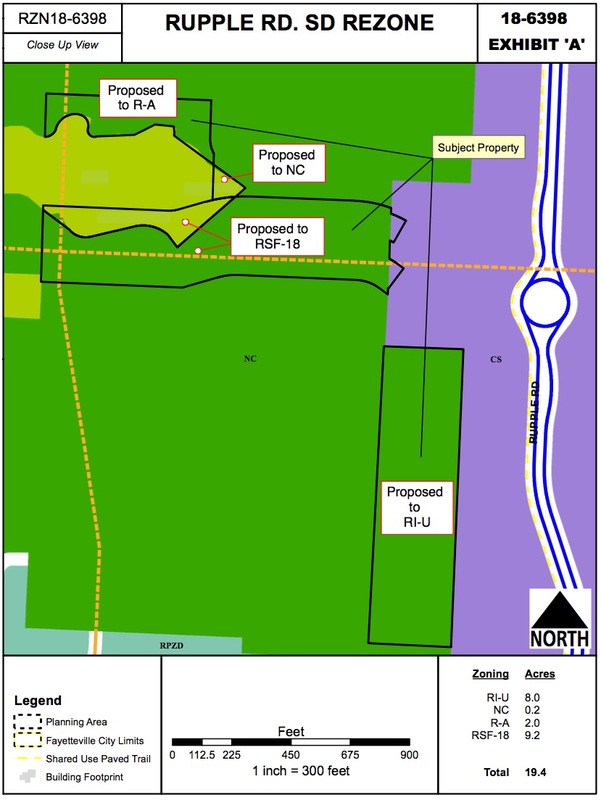 An ordinance to rezone that property described in rezoning petition RZN 18-6348 for approximately 1.36 acres located north of 2454 N. Deane Solomon Road from RMF-24, Residential Multi Family, 24 units per acre and C-2, thoroughfare commercial to C-2, Thoroughfare Commercial. This item was left on the second reading at the Nov. 20 meeting. Both city staff and the Planning Commission recommend approval. Council member Smith said he doesn’t have a problem with the rezoning request, but would prefer to wait until the drainage issues on this property are taken care of, which should be in the next two weeks. City Engineer Chris Brown said the drainage work hasn’t yet occurred, but said once some paperwork is completed, he expects the drainage work to take about two weeks. Permits have been applied for and a contractor is in place, Brown said. The council agreed to leave the item on the second reading. City staff said the grading permit is in and the silt fence is up, but the retention pond is not yet complete. Council member Smith said he’s a little hesitant because he doesn’t believe the requested zoning is compatible with the nearby neighborhood. La Tour said he agrees, but the company has been doing business in Fayetteville for a long time, and that the requested zoning would simply allow the company to do what it’s been doing on the land for a long time (storing tractors on a dirt lot). The ordinance was approved 6-1. Smith voted against. Marsh was absent. An ordinance to vacate a portion of a utility easement in Phase II of the Oakbrooke Subdivision. 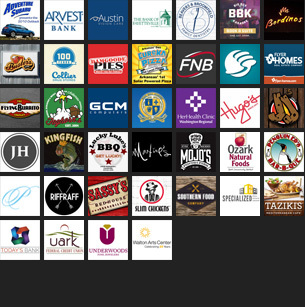 This item was sponsored by Council Member Mark Kinion. City documents don’t indicate whether staff are in favor of the request. Kinion said it appears to be an oversight that the property was not originally vacated. He said the home on the easement is under contract to be sold and this needs to be taken care of tonight. A representative for the applicant said there are other easements that need to be vacated tonight as well. City Attorney Kit Williams said the request to vacant the first easement should be granted because a home has already been built on the easement and is under contract to be sold. He said that is obviously a special circumstance that justifies the council bypassing the Planning Commission. However, he cautioned the council not to bypass the commission when granting vacation of the other easements on the property because special circumstances haven’t been shown for those areas. The applicant said they already went through the full process to plat the property years ago – including gaining approval from the Planning Commission and receiving certificates of occupancy – but the city’s GIS Department shows that those changes were never recorded. Council members Kinion, La Tour and Tennant said they believe it’s clear there are special circumstances that justify immediate vacation of all the easements since this whole process has already occurred, but wasn’t properly recorded. Williams said the council at least needs legal descriptions of the other easements before it vacates them. He said if those were provided, the other easements could be vacated at the next council meeting. Kinion agreed and suggested passing the ordinance, which grants the initial vacation, and requested the city attorney draft an ordinance to vacate the others to be presented at the next council meeting. This ordinance was approved 7-0. Marsh was absent. An ordinance to rezone that property described in rezoning petition RZN 18-6398 for approximately 19.15 acres located northwest of Rupple Road and Alberta Street from R-A, Residential Agricultural and NC, Neighborhood Conservation to RI-U, Residential Intermediate-Urban, RSF-18, Residential Single Family, 18 units per acre; NC, Neighborhood Conservation; and R-A, Residential Agricultural. An ordinance to approve VAC 18-6416 for property located west of 2122 W. Moore Lane in the Springwoods commercial planned zoning district to vacate a portions of utility easements. An ordinance to waive the requirements of formal competitive bidding and approve a cost share agreement with RPA, LLC for the installation of a sewer main along a portion of Sequoyah Drive between Rex Drive and Company Street, with the estimated amount to be paid by the City of Fayetteville not to exceed $80,041.67, and to approve a project contingency in the amount of $8,004.17. City staff are in favor of the ordinance. 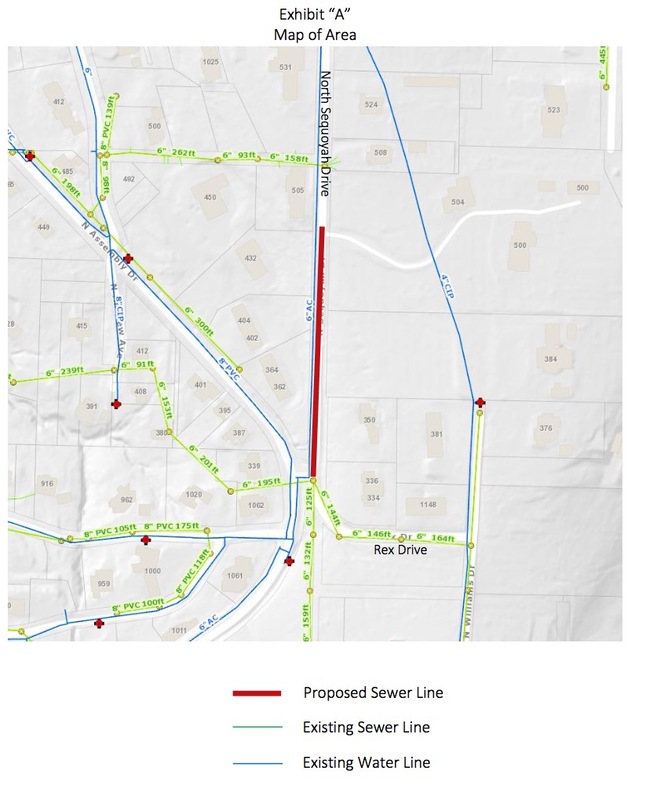 Community By Design (on behalf of RPA, LLC) requested that the city share in the cost of extending an 8-inch sewer line about 608 feet along a portion of North Sequoyah Drive between Rex Drive and Company Street. About 1/3 of the improvements are along property frontage owned by RPA LLC, and the remaining portion is available for use. Staff said the work will allow the properties at 500 and 504 North Sequoyah Drive to obtain sewer service, which will facilitate lot splits and the development of those properties. The increase in line size from what would normally be required will allow for any future developments that may occur in the area. An ordinance to waive the requirements of formal competitive bidding and approve a cost share agreement with Eric A. Long and Robert A. 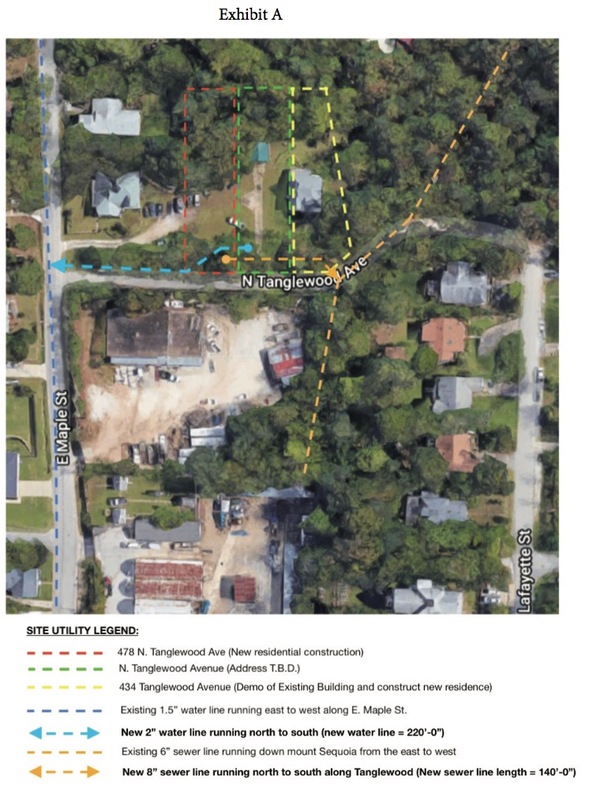 Long for the installation of water and sewer mains along a portion of North Tanglewood Avenue, with the estimated amount to be paid by the City of Fayetteville not to exceed $33,653.62, and to approve a project contingency in the amount of $3,365.37. The owners of the properties requested that the city share 50 percent of the cost of constructing a water and sewer main in the area. Staff said the work will allow for the development of three properties: 434 Tanglewood Avenue, 478 Tanglewood Avenue and a proposed middle lot which has no address yet. The mains will also serve any future developments in the area. An ordinance to waive the requirements of formal competitive bidding and approve a contract between the City of Fayetteville, Arkansas and Fayetteville Youth Center, Inc. in the amount of $225,000.00 to provide public recreation services for the youth and citizens of Fayetteville for 2019. This annual program is for recreational services for residents, including transportation for children. A working agreement is included in the agenda packet for this item. An ordinance to waive the requirements of formal competitive bidding and approve a contract between the City of Fayetteville, Arkansas and the Area Agency on Aging of Northwest Arkansas in the amount of $103,887.00 to provide public recreation services for the senior citizens of Fayetteville for 2019. This annual program is for recreational services for senior citizens. A working agreement is included in the agenda packet for this item. An ordinance to waive the requirements of formal competitive bidding and approve the purchase of child safety seats from EvenFlo Company, Inc. through 2023 in the estimated amount of $16,000.00 per year, and to approve a budget adjustment. This annual program provides child safety seats through the city’s community outreach program. Staff said the grant used to provide $15,000, but was reduced to $1,000 last year. Budgetary savings is proposed to fund the additional money needed to continue the program. An ordinance calling and setting a date for a special election on the questions of the issuance by the city of sales and use tax refunding bonds and sales and use tax capital improvement bonds for various purposes; levying a replacement special local sales and use tax at the rate of one percent (1.00%) for the purpose of retiring such bonds; and prescribing other matters pertaining thereto. More details about some of the specific projects are available on the city’s website. City Attorney Kit Williams read the full ordinance, which took about 30 minutes. Chief Financial Officer Paul Becker said it’s possible the bonds could be paid off in 10 years. Council member La Tour said he likes the fact that the items will be voted on individually. Chamber of Commerce President Steve Clark spoke in favor of the proposal. Fayetteville Advertising and Promotion Commission Executive Director Molly Rawn also spoke in favor of the proposal. Council member Tennant said he thinks it could be better to include language in the proposal that guarantees replacement of parking at the West Avenue lot instead of just suggesting that it will be replaced. He said he trusts the mayor, who has said before that he won’t take parking away without replacing it, but said residents might feel more comfortable voting for the arts corridor if a promise was included to keep parking. Kinion said one thing he’s proud of is the possibility of building a new police facility. He said the current department operates out of the former JC Penney auxiliary building, and that it’s time Fayetteville constructed a purpose-built facility for its police department. Smith said he agrees that losing the West Avenue lot would be a “disaster,” but he wants to make sure there’s enough flexibility in any added parking-related language that allows the city to build what it needs. Petty said the city should be cautious when making a commitment to replace or add parking without specific data that proves it’s needed. He said a recent study found there are thousands of parking spaces in or near the entertainment district that are either underutilized or could be accessed for public use. That study, he said, suggested the city address those spaces before building a new parking deck. He said he would support the idea of building a deck if it’s found to be necessary at some point, but said it would be a mistake to bind a future council’s hands without knowing what the future will bring. La Tour agreed with Tennant and Gray. City Attorney Kit Williams said it could be tricky to guarantee replacement parking in a voter-approved bond issue. He said if the language guarantees a new parking facility, then it must be built regardless of whether some other opportunity arises that could address parking or if replacement parking somehow becomes unnecessary. He said the language was carefully crafted to give the city some flexibility based on the mayor’s promise, but so as not to bind the city into building a parking deck no matter what. Chief of Staff Don Marr said while there is data that suggests underutilization of some parking spaces, there’s also data from citizen surveys that suggests a majority of drivers value proximity when considering parking (some of those spaces that were deemed to be underutilized include the Washington County Courthouse parking lot, which is east of College Avenue and several blocks away from the West Avenue lot). On that same note, he said if the language is to be tightened when referring to replacement parking, then proximity should be considered. There’s been talk of delaying tonight’s vote until the next meeting to give council members and city staff a chance to consider new language about replacement parking. Petty said the proposal isn’t perfect in his opinion, but said it’s a good consensus plan and that it should be voted on tonight. However, he said if the council wants to delay the vote, then it should consider having a working session to go over all aspects of the plan similar to the annual sessions it hosts to discuss the budget. Kinion moved to send the ordinance to the second reading. Smith seconded. The motion failed, with Tennant, Bunch, La Tour and Gray voting against. Petty suggested holding a Saturday, Dec. 8 public work session to go over the proposal’s details. Williams suggested having it at the next agenda session on Dec. 11. The council agreed. The proposal was left on the first reading. The discussion will continue at the agenda session on Dec. 11 and then appear before the council again on Dec. 18. This meeting was adjourned at 9:55 p.m.